At Clopper’s Mill Dental Care in Germantown, we believe passing down quality dental habits to your children isn’t just good practice—it’s imperative to their long-term oral health. Here are a few ways to help your kids develop positive dental habits, face their fears of the dentist, and understand the short-term and long-term consequences of poor oral health. Don’t tell them how to brush—show them. Proper brushing is the cornerstone of oral health, so it’s important to teach good brushing habits to your children from the start, and reinforce those habits over time. While lecturing and explaining how to brush properly can get some ideas across, it’s best to show your child how to brush their teeth by manipulating their bodies for them so they have an idea of what proper brushing motions feel like. Children under six years old have limited motor skills and physical ability, so brushing solo might be clumsy and ineffective. 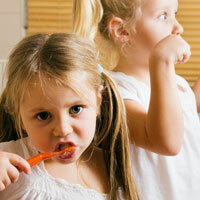 Guide them through the brushing process, twice-a-day, until they gain the motor skills necessary to maintain oral health. Once they’ve moved to solo brushing, monitor their activity to make sure they retain positive habits (and don’t cheat on brushing). Children must learn the physical motions of brushing, but they also need a positive role model to illustrate the consistency and discipline it takes to brush properly. That’s where parents come in. Make brushing a group activity, and brush along with them. It’ll keep your child engaged in the brushing process, and will keep your teeth looking healthy and vibrant as well. When teaching anything mundane to kids, it’s important to bring games and toys into the equation. The best (and perhaps, only) toy that helps improve your child’s oral health is an electric toothbrush. Your child will find the buzzing motion and turning gears to be fun and exciting, and the spinning bristles can help clean teeth more effectively while offsetting your child’s limited motor skills and dexterity. Brushing to your child’s favorite song is another way to bring technology and fun into the brushing routine. The song will help illustrate how long it should take to brush, and keep your child actively involved in the brushing process. Show them the consequences of poor oral health habits. While it would be inadvisable to instill an unhealthy fear or paranoia about oral health into your child, illustrating the consequences of poor oral health can help your child stay motivated and focused on practicing quality dental habits. For kids with high levels of focus and comprehension, it might be effective to use the “gross out” technique by showing them photos of people with dingy, yellow, and unsightly teeth. However, younger children might benefit more from a wholly positive, light, and fun approach. Take your young child to the dentist early and often. A child should go to the dentist’s office as soon as teeth begin to appear, and follow-up exams should happen at least twice a year to make sure small problems don’t escalate over time. These visits will help keep your child’s teeth in great shape, and will give them a good understanding of what happens at the dentist’s office, making them more comfortable with the process over time. Show them the dentist’s office can be painless and fun—even if you don’t think so. If you’re reading this right now, there’s a chance you have fear or anxiety associated with the dentist’s office for one reason or another. Perhaps you had a seemingly traumatic dental experience as a child, a pushy, aggressive dentist, or incredibly sensitive teeth that make dental procedures beyond uncomfortable. Regardless of your negative dental experiences, you would be doing your child a great disservice by passing down your fears and negative feelings about the dentist. Even if it’s incredibly difficult, fake it—set a good example for how enjoyable and beneficial the dentist can be. That positivity will help your kids develop lifelong fond (or at least, tolerable) feelings about the dentist, which will make trips to the dentist’s office a whole lot easier. Maybe you’ll trick yourself into enjoying the dentist a little more along the way. At Clopper’s Mill Dental Care, we celebrate the fact that we are the best Germantown dentist for the whole family, and we aim to make everyone that comes into our office healthy, happy, and most importantly, comfortable. Combined with solid parenting and quality dental education, we believe we can lead children all over Germantown, Gaithersburg, and Clarksburg to positive dental habits and pristine oral health. 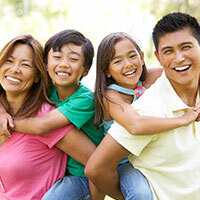 Contact us today, and schedule appointments for the whole family!